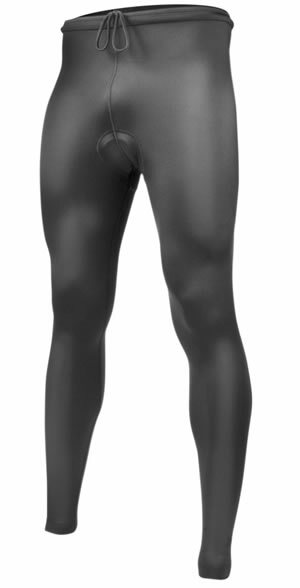 Men's padded cycling tights for men. Compression that feels great. Technically Designed exercise tights provide an extra layer of insulation and coverage on chilly days during your cycling workouts. Tights are very stretchy with a high spandex content. 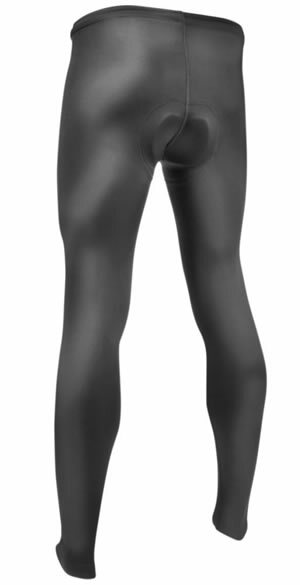 The high spandex gives you a comfortable level of compression because they move with you as you exercise. Tights are made from a fabric that is rugged yet silky soft, a beefy weight 7.6 ounces per square yard, and 80% Nylon and 20% spandex. The legs have a non-binding elastic hem and and a wide drawstring waist. Legs are generous length with gripper cutoffs that hold onto your socks and won't ride up during your workout. Padded tights have the Classic Chamois pad. Sizing Note:We recommend using this size chart for spandex workout tights. They fit like you see in the photographs. Choosing a size is based on how much compression you want during your workout. If you understand and want alot of compression, order a size smaller, it will fit you fine. If you want it loose fitting and airy with space in the legs order a size larger. This tight is very flexible with 20% spandex. Sizing Note:We recommend using this size chart for spandex workout tights. They fit like you see in the photographs. Choosing a size is based on how much compression you want during your workout. If you understand and want a lot of compression, order a size smaller, it will fit you fine. If you want it loose fitting and airy with space in the legs order a size larger. This tight is very flexible with 20% spandex. Product was exactly as advertised. Good fit, comfortable, and nice padding. Good value. Highly recommend. Probably shouldn't rate these yet as I haven't used them on the road (still pretty warm), but they're basically a long version of my classic 2 shorts and I'd wear those all day if I could - they are that comfortable. I' ve worn these tights around the house some and I'm sure they won't disappoint on the road. Bought these for my husband. They run small, so order next size up. Overall I am please with the build quality of the garment. Everything I've purchased from ATD had been top notch with regards to manufacturing. I will say that the pad does not reach as far back in the posterior as I would have expected. This isn't a problem for me as I ride in an aggressive position, but someone riding more upright on a hybrid might have an issue. I've worn these several times with temps between 45 and 55 degrees. On cloudy, windy days they seem a bit cool. On sunny days, even with some wind, these tights at toasty warm and make the ride very pleasant. Good fit with comfortable compression. Use at temperatures of 45F and good, not too hot or cold. Use for 2-3 hours cross country riding so the padding is the only part I would improve. Over all great pair of tights. The padding is a big noticible improvement for me and i certainly plan on getting a similar pair of shorts for the summer. My only negative is that they are a liitle long. I bought these tights for my husband. These are the perfect thickness for cool riding. Not too warm not too cool! 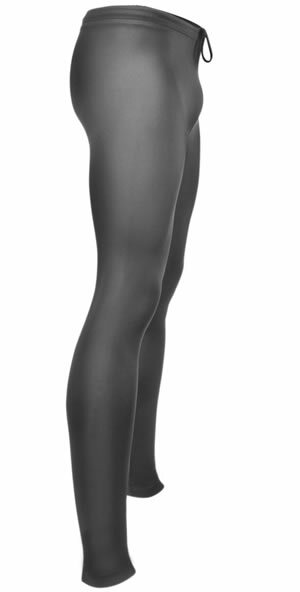 Perfect for fall or spring day probably not the best if you're looking for very cold weather tights. The quality seems very nice. Chamois good quality. I've bought these in the past. Now they are a little tighter which I love. I love a tight look and feel. Excellent products from an excellent company. I purchased a pair of these tights and a couple of different pair of shorts. All of them fit well and are quite comfortable. Your web site is great and I appreciate the information that is provided. Did I mention your customer service? It was also great. Great company, great products, fair price. I just love everything about this company. Excellent custom service. The product arrived quickly. Extremely well constructed and comfortable. The only down side is the length of the leg feels long. I am a size large but am only 5' 8" tall; so I have any an extra inch or two in the leg length.